An All-Big Ten performer in college, Bostic was chosen by the Oilers in the second round of the 1983 NFL draft. He moved into the starting lineup at strong safety during his rookie season and accounted for two interceptions and three sacks. Bostic proved to be a steady player in his first four seasons, noted for his aggressive play and teaming well with FS Bo Eason. The two combined for 162 solo tackles in 1985, a season in which Bostic reached a career high with five sacks. Coming into the 1987 season, Bostic had started 60 games, intercepted six passes, and registered 12 sacks. Oilers went 9-6 in the strike-shortened season (three games were played with replacement players) to finish second in the AFC Central and qualified for the postseason as a Wild Card. Won AFC Wild Card playoff over Seattle Seahawks (23-20). Lost AFC Divisional playoff to Denver Broncos (34-10). 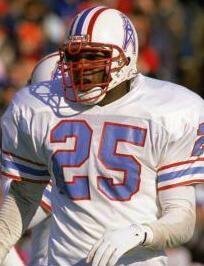 Bostic spent one more season with the Oilers, and was a Pro Bowl alternate, before departing as a free agent in 1989. He signed with the Indianapolis Colts but was waived during the preseason and, after a brief tenure with the Browns in 1990, his career came to an end. Overall, he played in 96 games over seven seasons, as well as four postseason contests, and compiled 13 interceptions and 17 sacks, all with the Oilers.